Making the most of a city can be tough without the right planning. Even with the best planning you can still miss some of the cities highlights. To help you make the most of Yogyakarta I created this three-day itinerary that includes the highlights of the city (and I’ve had a few years to prepare to write this guide). Before I start, let me be clear, I made the itinerary that I’d personally do if I was in Yogyakarta for three days and two nights (this is the average time most tourists come to the city). It includes the activities you shouldn’t miss along with some that you might have not heard too much about. If you want more ideas of things to do in Yogyakarta I’d suggest reading this post. The best tourist attractions in and around Yogyakarta start early and end late, so my recommendation is to take it easy for your first day in the city. There’s plenty of stuff that you can do to occupy your day. I’d start at the Kraton. Yogyakarta is actually ruled by a king and the Kraton is his palace. You can take a guided tour of the palace. It’s not very big and the tour doesn’t last more than 30 minutes, but it gives a nice insight into the culture of Yogyakarta. In front of the palace is the main city square, called Alun Alun. In the middle of the square are two large trees. According to local legends, if you can walk between the trees blindfolded then you will have a lucky year. Although it sounds easy, it’s a lot more difficult than it looks. After walking successfully through the gap between the trees (I have faith in you), head to the water palace. It’s just a short 10-minute drive away from the central square. The Water Palace (called Teman Sari) is a series of pavilions and pools built on some natural springs. It’s beautiful, which is probably why it’s listed by UNESCO as a World Heritage Site. Visiting the Kraton, Alun Alun and Teman Sari will take at least half a day. If you choose to you can spend some time exploring the backstreets and alleyways of the old city. It’s an activity without much purpose, but it’s interesting to stroll around. Depending on what day (and season) there’s always the chance to watch the Ramayana Ballet in the evening. This event is one of the largest dance performances in Yogyakarta, with almost 300 people performing in the ballet. The story is based on a Hindu poem from Sri Lanka. Set against the backdrop of the Perambanan temple, this beautiful story is acted out by a cast of professional performers and is the perfect way to start your vacation. You can find out more about Ramayana Ballet here. Ok. I’ll be honest with you, I’m not a morning person, but it’s still worth doing. The start time for this is 4:30 in the morning… So if you can drag yourself out of bed to watch sunrise at Borobudur, then you should do it. While it’s possible to join an organized tour, I’d advise arranging a car rental for the day. It’s a lot more convenient having a personal car with a driver. Plus you get to sleep in a little longer (like I said, I’m not a morning person). 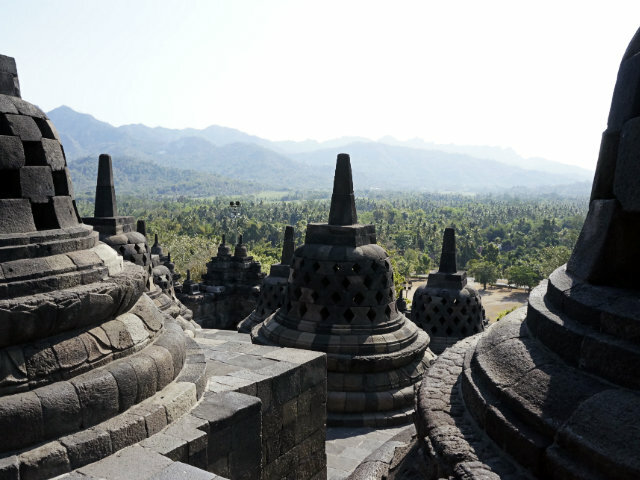 Borobudur is a UNESCO World Heritage Site, biggest stone temple in Indonesia. It’s pretty much an essential part of any itinerary for a person visiting Yogyakarta. Entrance costs for foreign tourists is high, but if you are well prepared you can actually get reduced prices (you can get a Borobudur, Prambanan and Ratu Boko combined ticket). After visiting Borobudur it’s time to visit Prambanan. 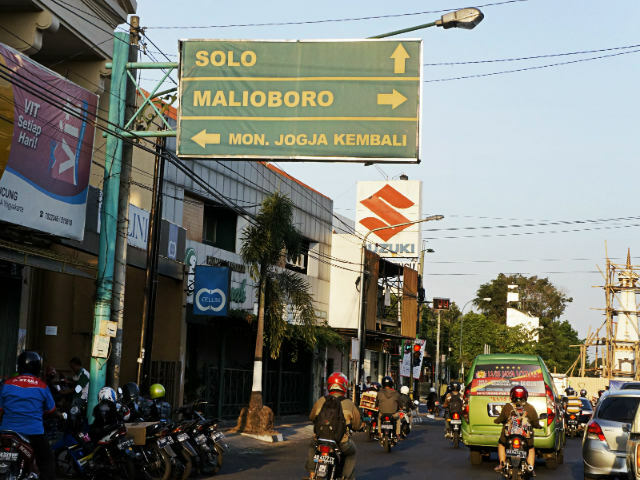 To get to Prambanan from Borobudur you basically have to return to Yogyakarta. The temple is located just on the outskirts of the city. You’ll arrive at Prambanan at around 1-2pm depending on how long you spent exploring Borobudur. Prambanan is a series of temples spread out over hectares of parkland. The trees offer some welcome shade, which is nice in the heat of the day. Now at this stage there’s a large possibility that you will be templed out (yeahp, it can happen pretty quickly). However, if you do have the energy and you want to catch a beautiful sunset then Ratu Boko temple offers a nice way to end the day. Candi Ratu Boko is located on a series of hills overlooking Prambanan. The temple is just a 20-minute drive from Prambanan, so it’s also pretty easy to get to. You can find a bit more information about the temple here in case you are interested. One of the things I really like about Yogyakarta is that the city offers such a great mix of things to do. There are the temples, the cafes and finally the nature… And for me this is the best way to finish a trip to Yogyakarta. Goa Jomblang is a huge series of caves located 90-minutes outside of Yogyakarta. This is in my opinion one of the best things to do around the city. The trip takes half a day and again though it’s an early start (you’ll be leaving Yogyakarta at 7am). The drive to Goa Jomblang is beautiful in parts. There’s one section of the road that rises from the valley floor in sweeping s-bends that gives you the chance to see as far as the horizon. It’s a view that’s best appreciated on the way back from Goa Jomblang though (you can have lunch at a restaurant by the side of the road). Goa Jomblang forms part of an organized tour. The reason for this is that the start of the tour involves abseiling 60 meters over the side of the cliff (yes, it’s as fun and scary as it sounds). Once you have been lowered over the edge of the cliff you arrive in a chasm in the ground. From here you descend into a large series of caverns. The highlight of the trip to Goa Jomblang is the main cave. There is a huge hole in the main roof of the cave. In the morning the rays of the sun shine through the hole lighting up the cave in a ray of light. The view is really spectacular. After visiting Goa Jomblang you will return to Yogyakarta at around 2-3pm in the afternoon. It’s about the right time to pick up your bags from the hotel, check out and think about heading off to the airport. There are a lot of things that you can do around Yogyakarta (it’s not just temples and caves). Some of the other popular highlights include trekking Merapi and climbing Merbabu. Of course there are also more temples, but I think three temples in one city is more than enough. P.S I hope you found these tips helpful. Whatever itinerary you choose, have a great holiday in Yogyakarta. I was looking for more information on Yogyakarta and Borobodur and found your articles. Just to drop a note to say thank you. Thank you for this!! Was just wondering. Have you been to Kalibiru National Park near Jogja? Yeah. Worth visiting. Some great tourist sites.